Each Friday in May I will be posting a clue for the next set of directions for the shawl. There will be 4 clues total. I will post the clues both on my blog and on the Mystery Shawl KAL thread in the Ravelry Group. After the last clue comes out, everyone will have two weeks to get caught up/finish their shawl. The KAL will end on Friday 6/10. Post a picture to the thread or give me a link to it on your blog and you will be entered to win valuable prizes! 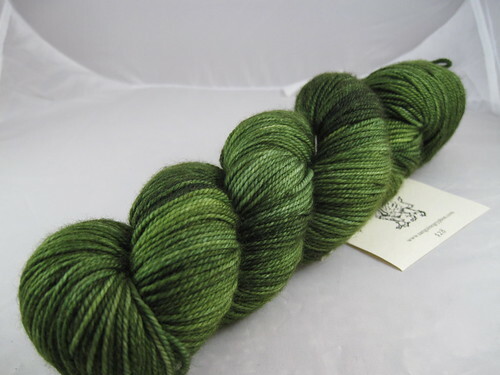 I will be using my precious skein of The Sanguine Gryphon Bugga in the Leaf Insect colorway! When the KAL is over, I will put the clues all into one pretty little pattern and it will be available on Ravelry for free. So, if you are playing along, you may or may not want to know the gauge for this shawl. Hope everyone has fun playing along. I think it will be a good time. Happy knitting!